Clearly, almost as many people want a simple, Kriegsspiel type game as want a complex military simulation. After pondering this conundrum I had an epiphany: ‘simple’ wargames and ‘complex simulations’ actually share about 80% of the same code and data. 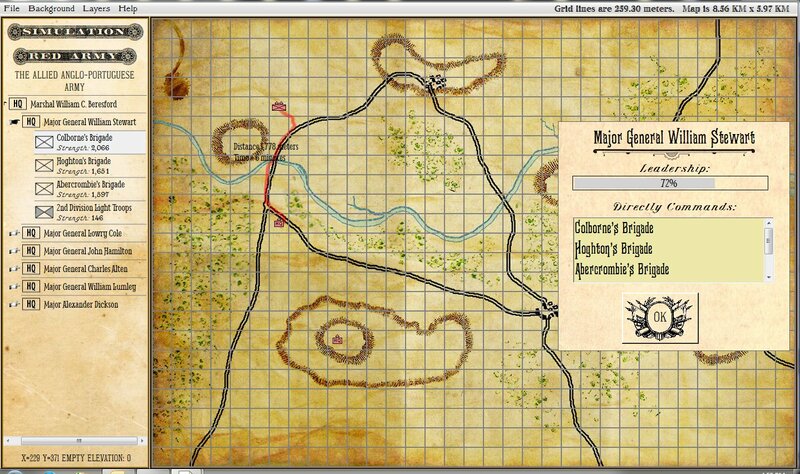 Why not make a wargame that the user can decide which he wants to play? Sometimes people aren’t up for hours long complex simulations; other times people are. Screen capture from General Staff showing the set up for ‘Simulation’ mode (note the button in the upper-left hand corner). Click to enlarge. 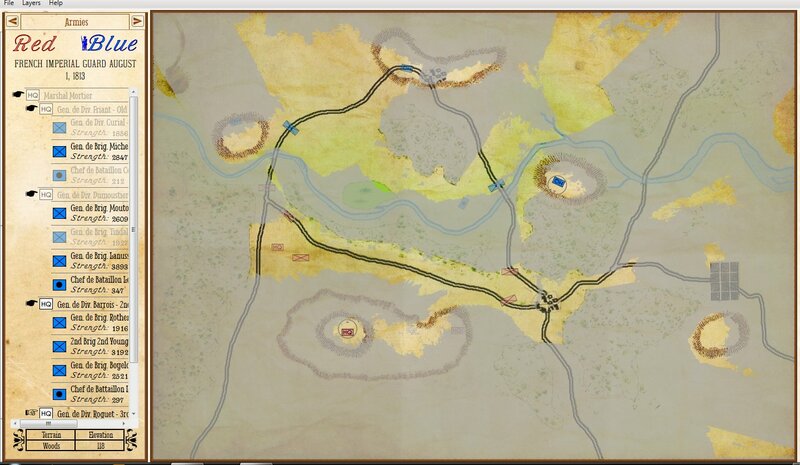 It will take 8 minutes for the courier to ride from Marshal Beresford headquarters to the subordinate’s headquarters. It will take an additional 6 minutes for a courier to deliver the order to the subordinate infantry unit. Click to enlarge. Additional time (based on the headquarter’s Leadership value) will be added before the next courier is dispatched to deliver the order to the infantry unit. 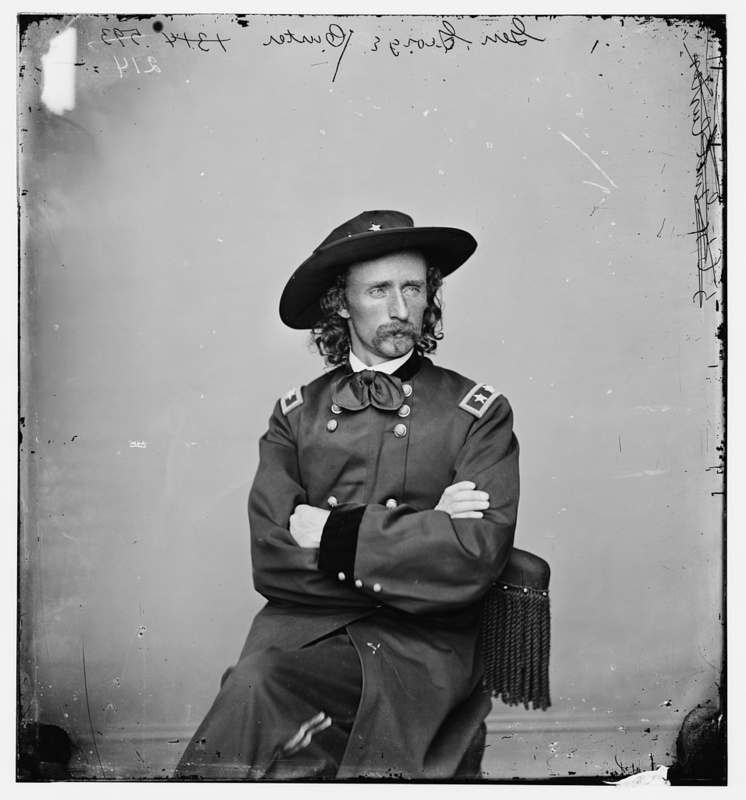 So for a command to go from Marshal Beresford, to Major General Stewart to Colborne’s Brigade will take a minimum of 14 minutes of game time plus additional time penalties based on the leadership abilities of Beresford and Stewart. Detailed information about a unit in Simulation mode. Even the number of volleys remaining are tracked. Click to enlarge. 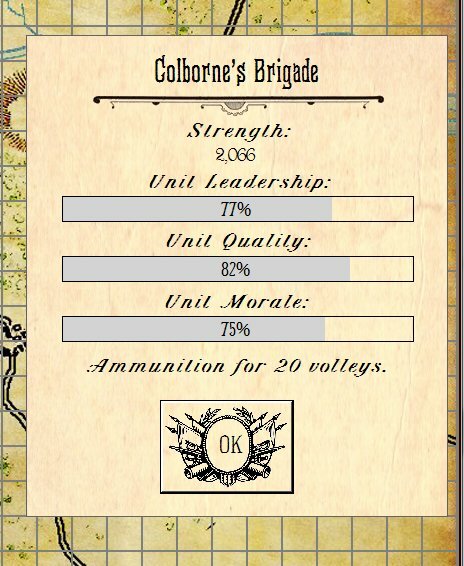 Lastly, the leadership of Colborne’s Brigade is used to calculate how quickly the unit will act upon the received orders. 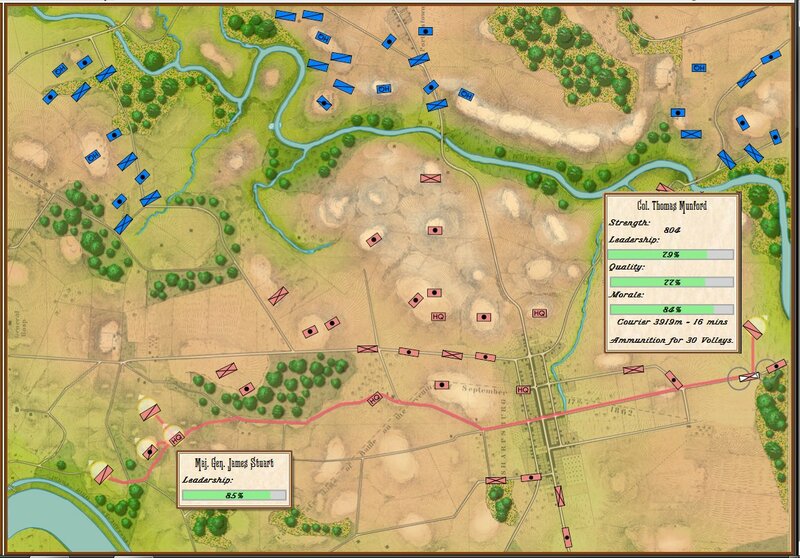 This is an example of the detailed Simulation mode for General Staff. 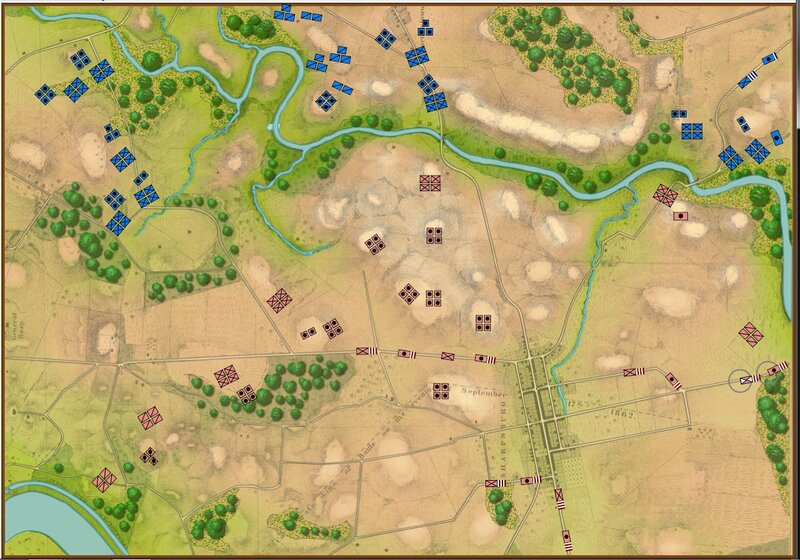 However, in Kreigsspiel mode, all headquarters units are removed and the user issues orders directly to the units that immediately respond to the commands. General Staff in Kreigsspiel mode. 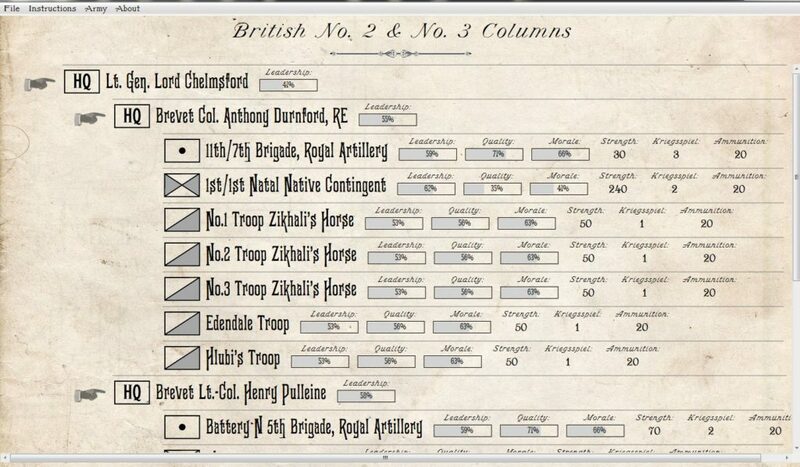 Note the button in the upper left-hand corner, headquarters units have been removed and unit strength is either 1,2,3 or 4. Also, all unit information except a simple value (1-4) is ignored. 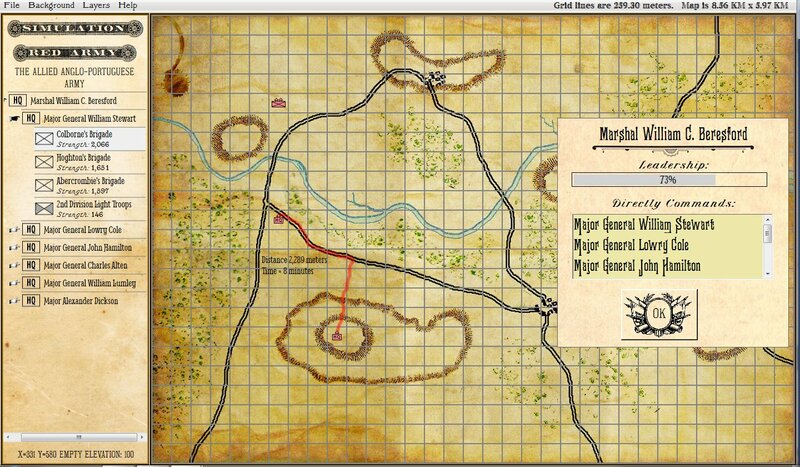 Kriegsspiel mode is the simple, introductory wargame that I originally envisioned. This entry was posted in Game Design, Gameplay and tagged Gameplay, Kriegsspiel, Simulation on April 23, 2017 by EzraSidran. Gameplay Surveys 1 & 2 Results. We just ran two Gameplay Surveys to find out exactly what kind of units and unit structures you wanted to see in General Staff and the results are in. We especially wanted to know, in general terms, if you wanted us to create a classic Kriegsspiel game or a very detailed military simulation like UMS, UMS II and The War College. 48%: I prefer simple unit data; just the unit type and unit strength. 52%: I want to include as much detailed information about a unit as possible. In other words, about half of you want a simple game and about half want a very detailed game. I must admit, I had to think about this for a while, but I’ve finally come up with a solution. This really isn’t about gameplay, it’s about the information that is stored about each unit and how the information is used for combat resolution. When an army is created using the Army Design Module all the required information will have to be added and stored within the unit data structure. However, when a user selects a scenario to play, the user will be able to decide if they want to play the ‘classic Kriegsspiel‘ or ‘complex simulation’ version. Unit Type. 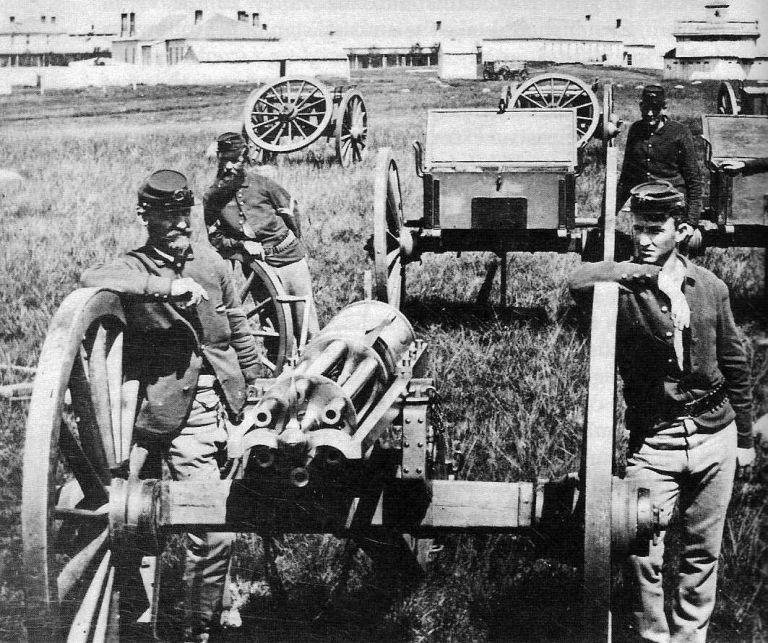 Such as, “Heavy Cavalry,” or “Field Artillery.” See below for more survey questions about pre-designed unit types. Unit Leadership. A value from 1-10 representing ‘poor’ to ‘superb’ leadership values. This will be displayed as a graph in the game. This value is used in the combat equation and to calculate how fast a unit responds to orders. Unit Quality. A value from 1-10 representing ‘poor’ to elite’ unit quality values. This will be displayed as a graph in the game. This value is used in the combat equation and to calculate how fast a unit responds to orders. Unit Morale. A value from 1-10 representing ‘poor’ to ‘elite’ morale. 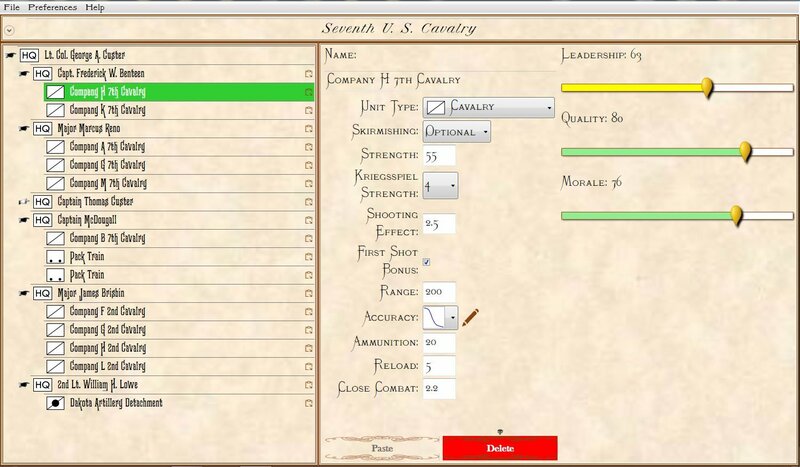 These values will change during the game in response to the results of the unit’s combat. This value will be displayed as a graph in the game and is used in the combat equation. Ammunition Level. A value indicating the number of volleys remaining for the unit. 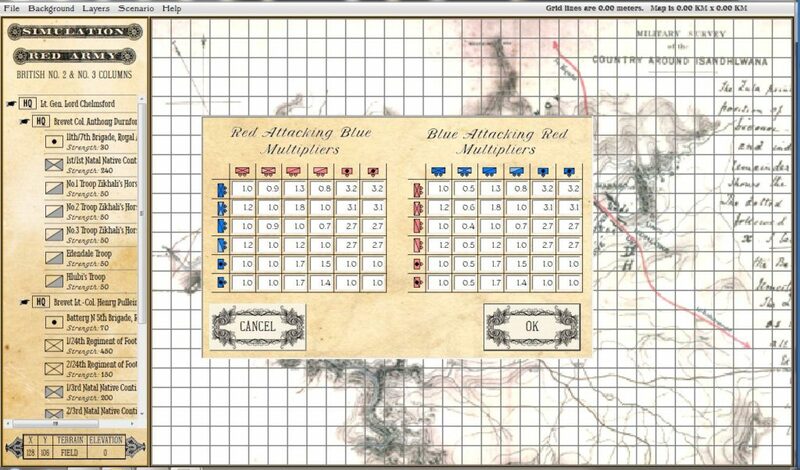 In the ‘classic Kriegsspiel‘ version of General Staff units have unlimited ammunition. 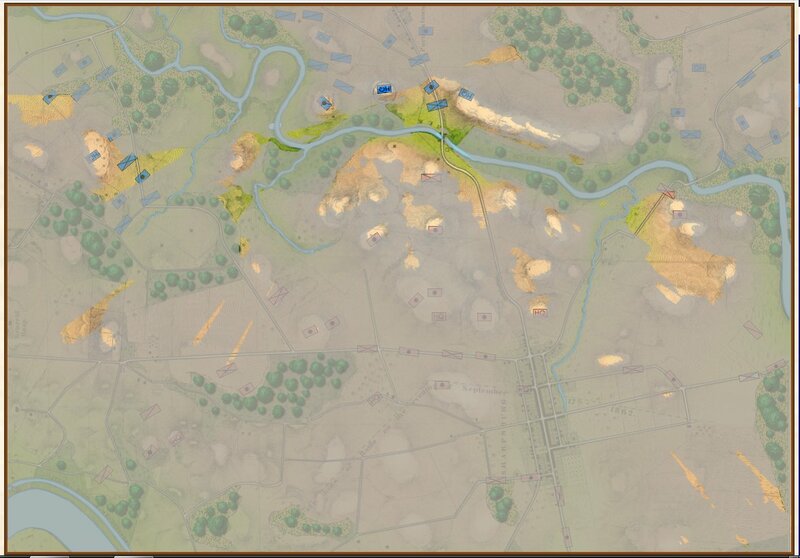 Infantry (line infantry), Light Infantry (including skirmishers), Cavalry, Light Cavalry (including lancers), Field Artillery, Horse Artillery, Headquarters (see below) and Supply Trains. 88% of users want a hierarchical army structure. Lastly, we asked you about screen resolution. 75% of users were happy with 1440 x 900 screen resolution. We understand that 25% of users want a higher resolutions and we’ll do our best to accommodate them. Feedback from users is very important to us. 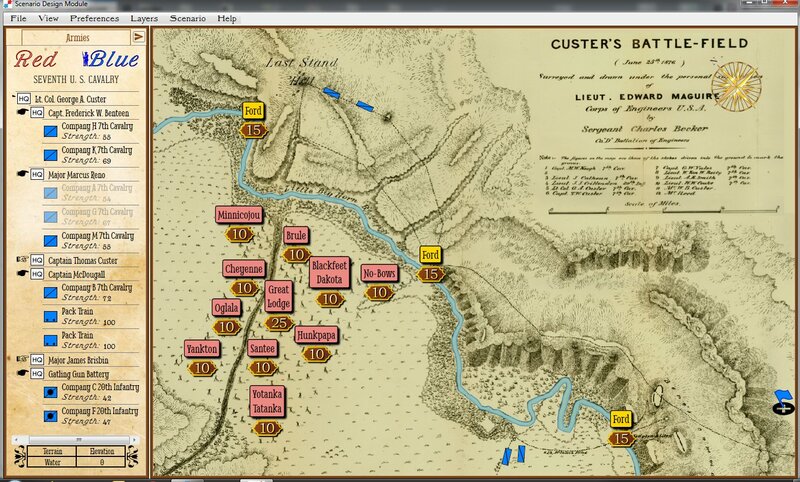 We want to create the wargame system that you want to buy. If you have other questions or comments please don’t hesitate to contact us here. 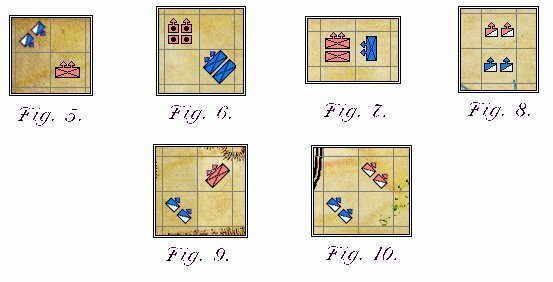 This entry was posted in Army Design Module, Game Design, Gameplay, Survey and tagged Army Design Module, Kriegsspiel, Units on January 13, 2017 by EzraSidran.